A common question among active people is what is the best snack or drink for recovery or to fuel with after a workout? There have been lots of studies suggesting the importance of fueling your muscles within the first 15-30 minutes after a workout and having the right combination of protein and carbohydrate, coupled with the less scientific ploys for consumers to buy various products, but the answer may already be in your refrigerator. A study recently done with women examined how supplementation post workout influenced changes in body composition and strength after resistance training (1). Twenty women were separated into two groups. One group received 500mL of fat-free skim milk on two occasions (immediately after exercise and one hour post-exercise), and the other group received 500mL of a carbohydrate control drink (immediately after exercise and one hour post-exercise). Both drinks looked identical in appearance and were flavored with vanilla to have the same odor. Each group reported to a lab five days per week for resistance training for 12 weeks. At the end of 12 weeks those who were placed in the milk group had significantly greater fat-mass loss, more lean body mass and greater strength gains than the group that received the control carbohydrate beverage. So, the next time you have a great workout and are wondering how to fuel after, grab the milk. 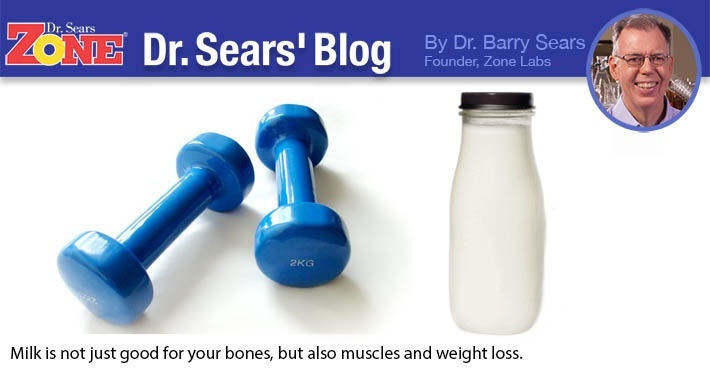 Not only will your bones thank you, but your body will too. Josse AR, Tang JE, Tarnopolsky MA, Phillips SM. Body composition and strength changes in women with milk and resistance exercise. Med Sci Sports Exerc. 2010 Jun;42(6):1122-30.